The Andaman Explorer is the first ocean cruise ship in the Pandaw fleet entering service in 2016. Refurbished in the Pandaw style, this ship offers exciting trips for all of her guests. 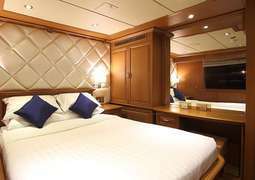 With only 10 suites this ship offers an intimate and relaxing experience. All the cabins are furnished in the Pandaw style and have a separate seating area. The Carrara marble floors add elegance to the rooms and a wide range of amenities ensure that guests receive the best possible experience. A local master chef prepares meals with an experienced international culinary team. Personalised meal services and themed dinners are also available, as well as an open air lounge and bar. There are options to suit every need. A private guide and transportation is offered for all excursions.